This tutorial shows you how to build a game similar to the Whac-A-MoleTM arcade game. Specifically, your goal is to tap a mole that randomly pops out of one of five fixed holes. Every time you succeed, your score is increased by one point. In order to highlight new App Inventor features — the Advanced tab and Sprite Z-layering — this app takes a different approach than the original Mole Mash tutorial, which you do not need to have completed in order to do this one. You should, however, be familiar with the basics of App Inventor — using the Component Designer to build a user interface and using the Blocks Editor to specify event handlers. If you are not familiar with the basics, try stepping through some of the basic tutorials before continuing. Connect to the App Inventor web site and start a new project. 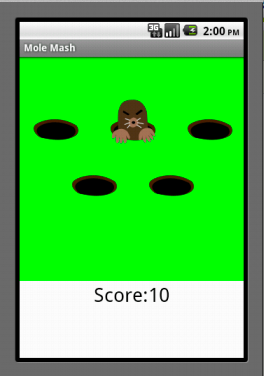 Set the screen's Title property to an appropriate name, such as "Mole Mash". Open the Blocks Editor and connect it to the phone. Download these image files (created by Yun Miao) by right-clicking on them, then add them to the project by pressing the "Add..." button in the Media pane. The user interface will contain a total of 6 ImageSprites: 5 unmoving holes and 1 mole, which will move on top of the holes. Use the component designer to create the user interface. When you are done, it should look something like the picture below. Don't worry about lining up the holes evenly. You will specify their locations through their X and Y properties. Additional instructions are below the picture. Create the following components by dragging them from the Palette into the Viewer. Label User Interface ScoreTextLabel To hold "Score: "
Canvas1 Set BackgroundColor to Green. Set Width to 320 pixels. Set Height to 320 pixels. Hole1 Set X to 20 and Y to 60 (upper left). Hole2 Set X to 130 and Y to 60 (upper center). Hole4 Set X to 75 and Y to 140 (lower left). Hole5 Set X to 185 and Y to 140 (lower right). Mole Set Picture to "mole.png". Set Z to 2 so the mole appears in front of the other ImageSprite s, which have the default Z value of 1. ScoreTextLabel Set Text to "Score: ". ScoreTextValue Set Text to "0". 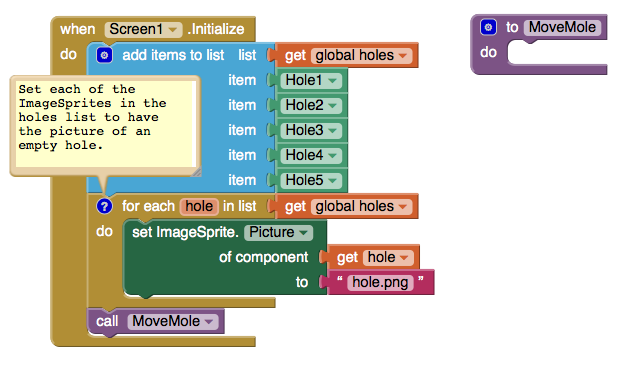 Don't worry now about setting the Picture property for the holes; we'll set the property in the Blocks Editor. Populate the list of holes. Set each hole's Picture property to "hole.png". Set local variable currentHole to a random hole from the list holes. Move the mole to the location of currentHole. Make MoleClock call MoveMole whenever its timer goes off (every second). Add one to the score. Make the phone briefly vibrate. To proceed, switch to the Blocks Editor. initialize global holes to Variables Hold a list of holes. create empty list Lists Create an empty list, to be filled in when the program starts. As always, comments (created by right-clicking on a block) are encouraged but not required. The first event to occur in any program in Screen1.Initialize, so we will put start-up code in that handler. Specifically, we will add the hole components to the list holes, set each hole's Picture property to "hole.png", and call MoveMole. Since we have not yet written MoveMole, we will create an empty procedure with that name, which we will fill in later. Below are a picture and table of the blocks you need to create. Note that the "Any ImageSprite" drawer is found under the "Any component" tab at the bottom of the list of Blocks in the Blocks Editor. Screen1.Initialize Screen1 Specify what should happen when the app starts. get global holes Variables ...to take on each of the values in the list holes .
" " (hole.png) Text ...to the picture of the empty hole. to procedure (MoveMole) Procedures Create an procedure, to be filled in later, for moving the mole. call MoveMole Procedures Call MoveMole to make the first placement of the mole. Not only is the left set of blocks shorter, it is less repetitious, sparing the programmer from semi-mindless copy-and-pasting and making it easier to modify, for example, if the name of the picture is changed. get global holes Variables ...hole. get local currentHole Variables ...the chosen hole. call MoveMole Procedures ...move the mole. Make the phone vibrate briefly. ScoreValueLabel.Text ScoreValueLabel ...the previous score. call MoveMole Procedures Move the mole to a new location. Adding a Reset button to set the score back to 0. Having the score depend not just on the number of hits but also the number of misses and escaped moles. Increasing the speed of the game of mole movement if the player is doing well and decreasing it if the player is doing poorly. Adding a second mole on a different timer. You can see how to implement the first two variations in the original Mole Mash tutorial. Putting components in a List. Performing an operation on every component in a List using the for each block and Advanced features. Placing an ImageSprite on top of another, using their Z properties to control which goes in front. Using the Clock component to control game play. Creating a procedure and calling it from multiple places. Looking for more information about Mole Mash? Check out the Book Chapter for more explanation and background information. Done with MoleMash 2? Return to the other tutorials here.